The rise and fall of Alexander Edler? At around this point last year, media in Vancouver were trumpeting the rise to prominence of Alexander Edler. Most lauded his putative status as a gem unearthed by Canucks European scout Thomas Gradin. Nearly all extolled his virtues as a much needed mobile, puck-moving defenceman. In early October, Edler was rewarded for the promise he showed last season with a new, four-year contract worth around $3.25 million per season, which is due to kick in next season. A move, I might add, that I applauded at the time. At the risk of being perceived as capricious with my analysis, given that less than two months have gone by, I think it’s worth pointing out that Edler has been tremendously disappointing this season. Before proceeding further, I want to make clear that the impetus for this post is most certainly not last night’s third period gaffe by Edler that led to the game-winning goal by Curtis Glencross. Sure, it was a terrible play. But any hockey fan worth his/her salt knows that young defencemen are, above all, prone to such lapses in judgment. Truth be told, I have become increasingly sceptical of Edler as the season has carried on. Moreover, I think that the evidence of a decline in his play near the end of last season has become even more remarkable after the first quarter of this one. Edler’s mobility is undoubtedly impressive. He is blessed with remarkable size for someone with his skating ability. And he can certainly shoot the puck. Edler’s primary and glaring deficiency is hockey sense. Seldom is there another Canucks defenceman who makes as many head-scratching decisions, particularly in his own end of the rink, as Edler does. For a defenceman, this is a problem that can be especially acute from the standpoint of your average armchair analyst. Of course, it is not a unique one among NHL defencemen. Except that those who are particularly prone to poor decisions in their own end of the rink tend to mitigate this with significant offensive production. Edler, though, has one goal and six assists, seven points in 21 games. This puts him at about 73rd overall among NHL defencemen. Not altogether impotent, I’ll admit, but also not entirely considerable in terms of potency. Put another way, no one is going to mistake Edler for Mike Green, Brian Campbell or even Joe Corvo. To put the point more starkly, perhaps, his production-to-date lags behind teammate Willie Mitchell. For Edler to be an effective defenceman in the NHL, he either needs to be a lot more productive or to shore up his defensive zone play considerably. TSN is confirming speculation that Canucks defenceman Kevin Bieksa will return to the lineup tonight against Calgary. ‘Juice’ hasn’t played since he was injured two weeks ago against Nashville. 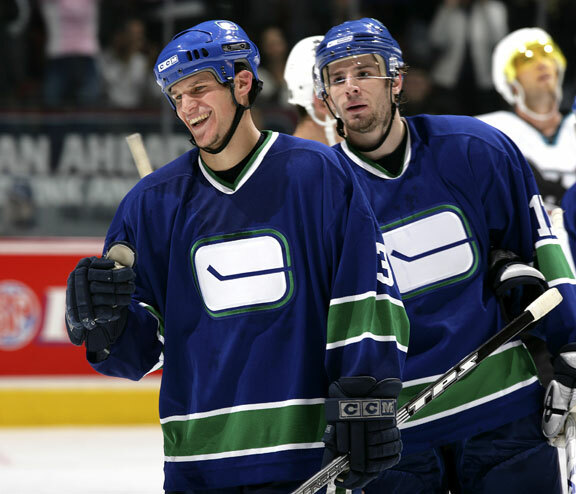 Prior to the injury, Bieksa led Canucks defencemen in scoring and was arguably playing his best hockey since 2006/2007. Apropos of my previous post on the matter, I expect Cory Schneider to play either tonight or Saturday in the home-and-home series against Calgary. If I had to bet, I gather that Alain Vigneault would prefer Schneider to play his first game on the road (if for no other reason than to mitigate the local scrutiny). If that is correct, Schneider is likely to play on Saturday night at the Saddledome Library. Truth be told, I hold out some concern that Curtis Sanford’s excellent play in Roberto Luongo’s absence might invite consideration that he should get a long run of games in while he can. Once Luongo returns healthy, Sanford will inevitably return to seeing the ice from behind his teammates on the bench. Whatever the merits of playing Sanford, I fear that if the Canucks don’t seize this opportunity to evaluate Schneider meaningfully at the NHL level (i.e. over a period of games and not spot-duty) the decision-making process surrounding what to do once Luongo makes his decision about whether to stay in Vancouver will be woefully inadequate. In other words, the Canucks simply won’t know what they have on their hands (in terms of either a movable asset or a starting goalie). It is imperative that the Canucks think long-term in the present circumstances. However, this should not be mistaken as sacrificing the immediate future. To begin with, I find it dubious to assume that Schneider would offer a significant downgrade from Sanford. Moreover, it is entirely possible for Schneider to get a few games in and if he falters replace him with Sanford. Ultimately, the Canucks coaching staff and management has to appreciate that they have a highly regarded prospect with an impressive record of achievement waiting in the wings. Making Schneider sit on the bench when a workhorse like Luongo is out for an extended period would be detrimental to both Schneider’s development and the organization’s talent management. First off, my apologies to anyone who actually reads this blog on a regular basis for the recent inactivity at Vancouver Viewpoint. A busy week at work combined with an even busier week after work resulted in me not being around the computer much. With that said, let’s get down to brass tacks. The injury to Roberto Luongo in yesterday’s otherwise impressive 3-1 victory over the Pittsburgh Penguins. Less than five minutes into the game, Luongo went down to make a routine save and seemed to injure his groin when he kicked out his left leg. Whatever the case, it was clear he was in a lot of pain. And Canucks fans let out a collective gasp of worry. While neither the extent nor the duration of the injury is clear at this point, the Canucks did recall Cory Schneider from Manitoba. That means Luongo will be out of commission for at least the next game against the Detroit Red Wings. Let’s assume, for the sake of a thought experiment, that Luongo is out for a few games. There are two ways for Canucks fans to look at the situation and two ways for the Canucks coaching staff to deal with it. As for the coaching staff, either backup Curtis Sanford is given the opportunity to get a run of games in or Schneider is provided with an opportunity to prove his mettle in the NHL. The way I see it, if Luongo is going to miss any more than three games, Schneider needs to play as many games as possible. Though it is obviously not what Sanford would want (nor what he thinks he deserves, under the circumstances), the Canucks need to see what Schneider can do at this level. 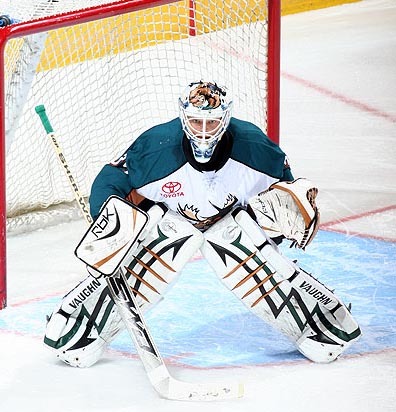 He has excelled at every level he has played (college, international hockey, and the American Hockey League) so there is not much more he can prove. More importantly, the Canucks face a situation where Luongo is due to be an unrestricted free agent at the end of next season. If he does not re-sign before the start of next season, it could be an indication that he has intentions to leave. And, if that is indeed the case, the Canucks will be turning to Schneider to be the number one. If he does re-sign long-term, then Schneider would have to be moved. Evidence of capability at the NHL level (coupled with his sterling play at all other levels) would make Schneider a highly valuable asset in any trade. So, the injury situation may not be as bad as it might seem, after all. Opportunity knocks, as they say.